Liam Gallagher posted a picture of himself and his 21-year-old daughter on Instagram last week. It was the first time he had seen her in 19 years and reportedly only the second time that he had met her. Earlier this year, Liam said Ms Moorish was “welcome in my world” but that she had never tried to contact him. Molly Moorish, who works as a model, was born in 1998 after Gallagher had an affair with singer Lisa Moorish while still married to Patsy Kensit. Molly Moorish posted the same black and white picture on Instagram, which shows her smiling alongside her father and two half-brothers. 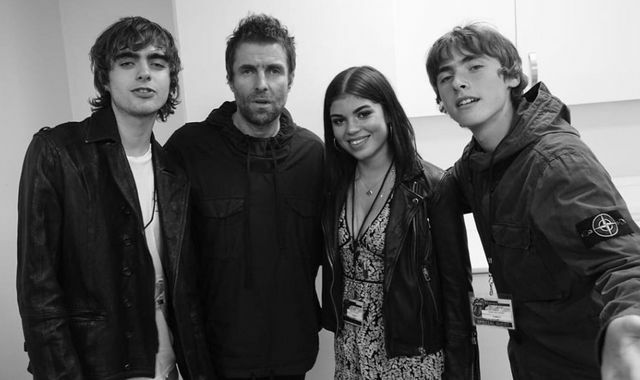 Liam’s sons, Lennon and Gene – who both have different mothers – appear on either side of the photo. Lennon is his son from his marriage to Patsy Kensit, while Gene was born two years later during his relationship with former All Saints singer Nicole Appleton. Liam also has a fourth child – a daughter named Gemma – from his relationship with US journalist Liza Ghorbani.